The menu for my world-welcoming brunch was blueberry-buttermilk pancakes (fodder for a future post), with two toppings I had canned (“put up” or “preserved” or, as those Ozzies down in Oz – or even the Australians in Australia – would try to tell you, I had “contained”). I served blood orange marmalade and blueberry syrup with the pancakes as well as yogurt, raspberries, and the world’s best granola. Golden brown and crunchy, the granola has finished baking. 1. Line-ups or queues, as they are more often known here, offer the most fascinating insights into human behaviour. Hoping for a bit of lobster, I headed to the Atlantic Canadian Pavilion for their “Prince Edward Island Day” free tasting. No, I was not hallucinating; they had served free mussels a few days before and mentioned lobster in a press release. 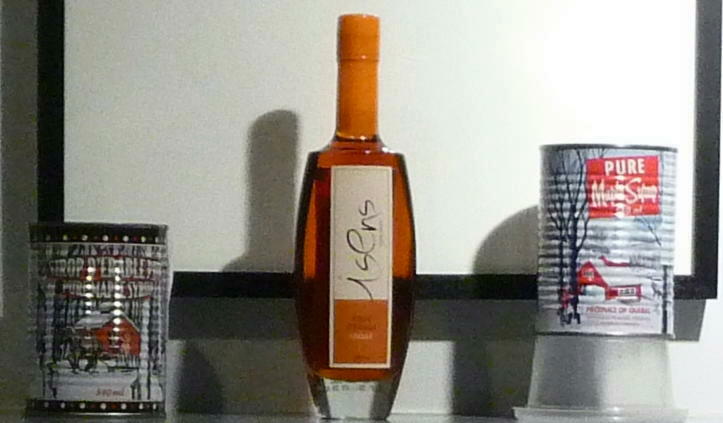 With a rather lengthy line in front of me, I asked a volunteer, if I would be able to get in for the tasting. Her post clearly was to provide information on the Atlantic Pavilion’s limited space and few activities. She said that it was almost “100% guaranteed” that I would not, even with a 20-minute wait. So I asked her why everyone else was still lining up, and she responded that it is hard to explain the situation to people, get them to understand, and convince them there is no point in their being in the line. Indeed. Nearby, the Swiss Pavilion (AKA, “Bridges Restaurant”, otherwise when the Swiss are not Swiss-Missing and Swiss-Mistering about the place) offered raclette and bratwurst for al fresco dining. I went into a line-up for these items, and I politely enquired of an older couple in front of me if they were waiting for the food. They replied, “We don’t know what we’re waiting for.” Honesty of this sort is rare and contradictory: endearing, in its earnestness, yet stunning, in its utter ignorance. When they figured out they did not want melted cheese on hearty bread with pickled onions and cornichons pickles or a brat, they decided to move to try their luck at some other queue-of-mysterious-outcome. I enjoyed my raclette, which had been on my mind of late, on a bench, in the sun on Granville Island, wondering what could be better, even for $8, than a short wait for such a satisfying classic Swiss-dish. 2. The Parmigiano Reggiano I sampled at Casa Italia tasted better than my hunk of formaggio in my fridge. I guess they trotted out the premium stuff for free tasting at Casa Italia. In front of a stack of five whole rounds of the cheese, the woman providing cheese to visitors was dressed very fashionably in a well-tailored suit and heels, looking as if she should be closing a deal in Milan, rather than doling out bits of the real-deal Parmesan in Vancouver’s Yaletown. Despite less-than-molto bene reviews online, this pavilion was definitely worth a visit for the fine display of Italian design, high-end and expensive sportswear for sale – it was fun to see clothes not available in Vancouver otherwise – and many brochures on foodstuffs from various Italian regions. I had just missed the wine tasting by 15 minutes. Imagine how much better it could have been (tastings, I think, are from 12 to 1 pm, and then 4 pm). 3. For a non-food related issue, my favourite on-street give-away was a free sample of an anti-snoring device called “Breathe Right”. It is an adhesive one places over the bridge of the nose to better open nasal passages to for improved breathing at night and, yes, ostensibly, to minimize snoring. On its own, this would have been remarkable as a give-away, but the manufacturer produced a “limited edition” for the games, with “Canada” -printed in white on a red background. Obviously this is the answer to those Canadians – and Canadian-wannabees, whoever and wherever they might be – who, simultaneously, want to prevent snoring, while expressing their “true patriot love” during their slumber. Mainly Canadian additions, but a few are from away. The Canadian content of this granola, since you asked during the 2010 Vancouver-Whistler Olympics, includes organic oats (from Saskatchewan) canola oil (ditto probably), dried cranberries (could be from BC), dried apricots (ditto again), pumpkin seeds (they also could be local), and honey, or, more stereotypically, maple syrup (Quebec, most likely). If the cashews and coconut are unquestionably from far away, we will just welcome them, too, along with the rest of the world, to British Columbia. Adapted from The Barefoot Contessa Cookbook, by Ina Garten. 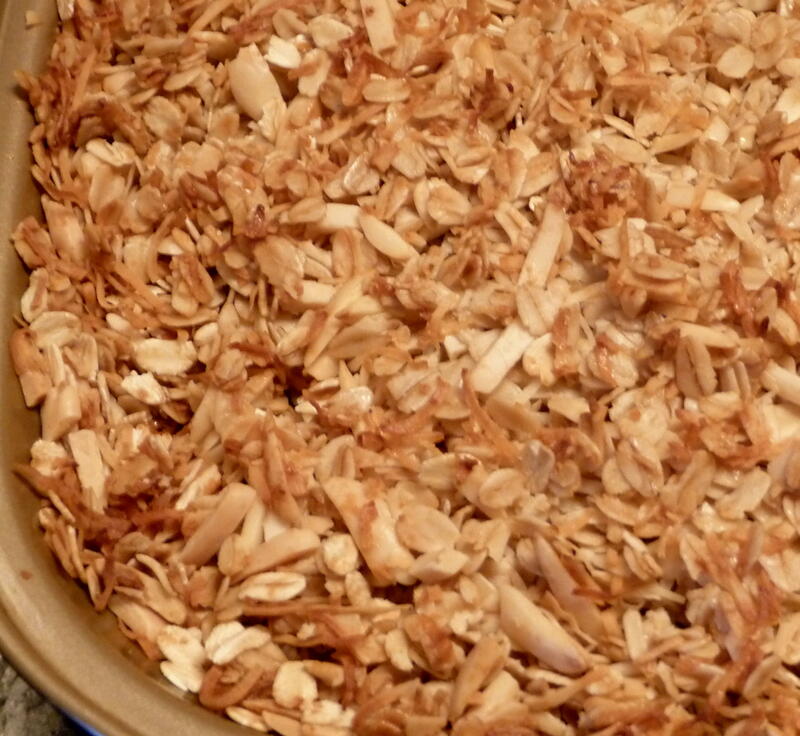 ·	In bowl, combine oats, coconut, and almonds. ·	In a separate bowl, combine honey and oil; whisk to combine thoroughly and pour over oat mixture. 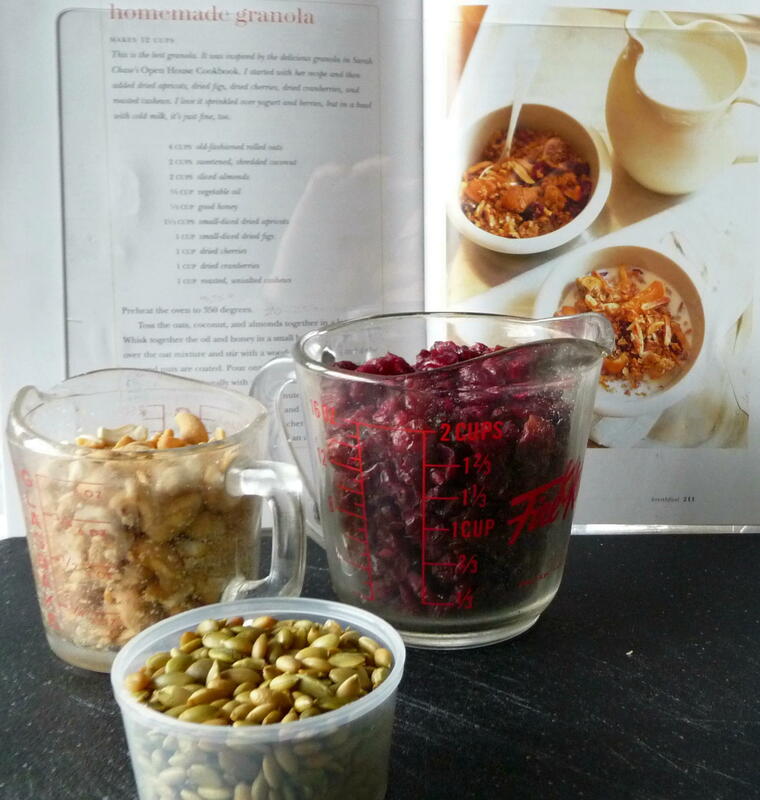 ·	Stir until all of oats are covered, place on two separate (parchment-covered, silpat-covered or good non-stick) baking sheets and spread mixture evenly around. 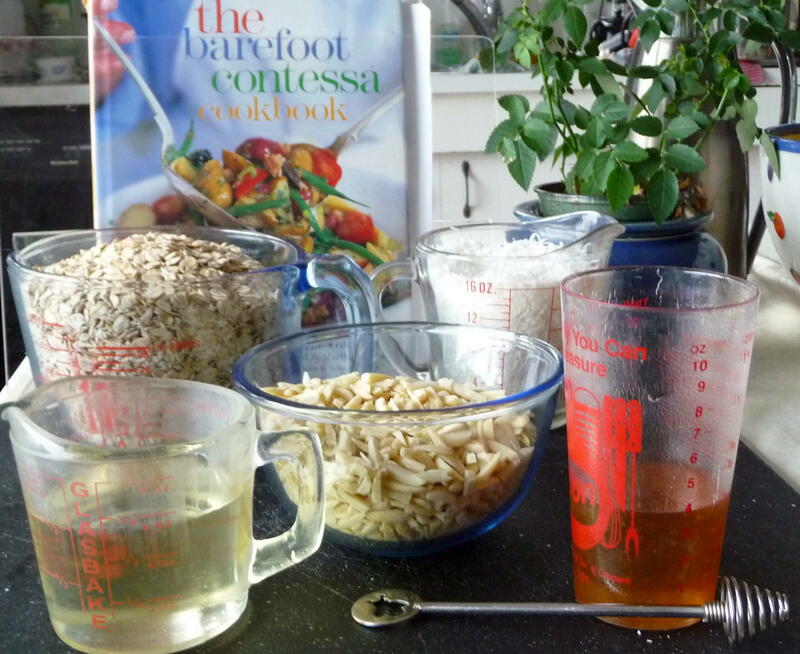 ·	Bake 25 -30 minutes or until oats become a light golden brown. 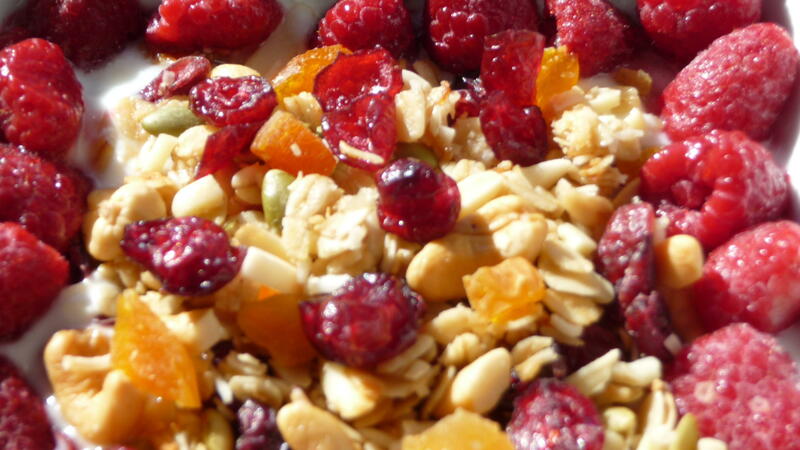 ·	Let cool and mix fruit into oat mixture. NB: This granola can be refrigerated for a few months in a tightly sealed container. 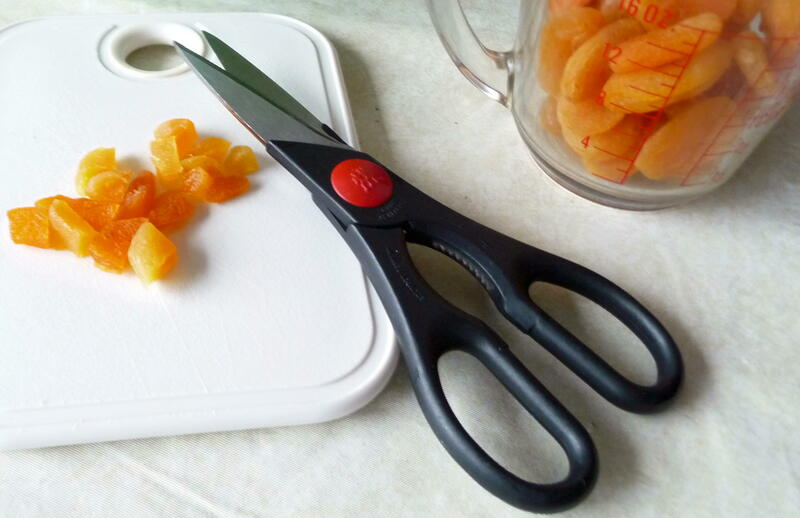 Oiled kitchen shears make dicing apricots a breeze. This entry was posted in Baking, Brunch, Recipes Misc and tagged Breakfast, Olympics. Bookmark the permalink. really insightful and funny observances about human nature. Also , I just yesterday opened the can of maple syrup pictured above, which you brought back for me from Montreal I believe, it’s so good! You’re welcome, Jess. Thanks for the nice comment. Y’all come back now, y’hear?! ?